Mmm…this was a really good, savoury vegetable dish! Cauliflower, bacon, cheese, eggs, milk and cream. It makes a lot as you can see so it’s a good dish for a casual dinner party. 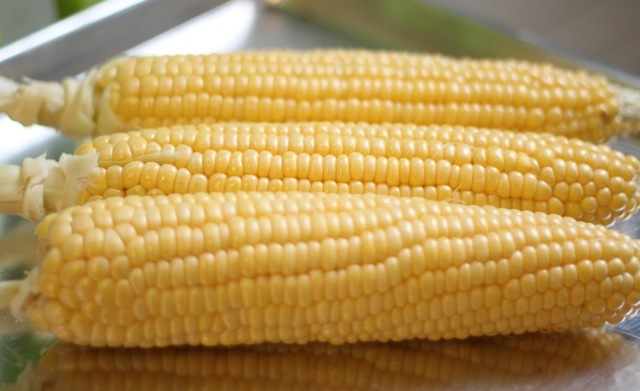 Dorie Greenspan gives her recipe here. 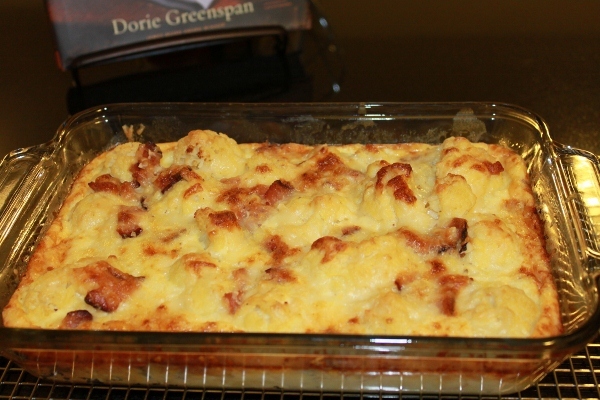 Visit the French Fridays with Dorie’s website for more cauliflower-bacon gratin. Blew the dust off my Around My French Table cookbook and joined the club again with this Creme Brulee. 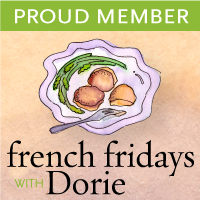 I checked the French Fridays with Dorie website on Tuesday and knew I could make this week’s recipe as there’ll be three egg yolks left over from the cupcakes I was baking for my son’s school. It’s also about time that I wrote a new post since my last post was back in October! I had been busy and was neglecting the blogging world for a bit but will be back next year with more regular reading and posting. I do missed visiting all the wonderful food blogs! 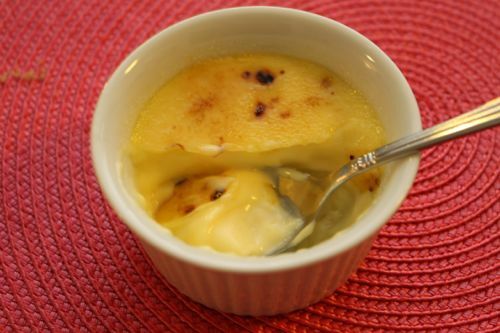 Anyway, back to the Creme Brulee, the custard was cooked on Wednesday and then all of a sudden….. it’s Friday! Where did the time go?? I baked the custard on Friday and served it on Saturday. 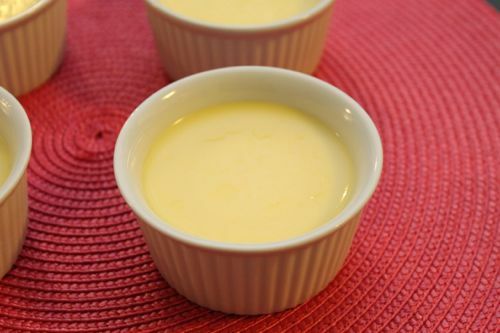 I baked the custard for 50 minutes and left them in the oven to cool as they were still too jiggly in the middle. Dorie could fill 6 ramekins with 1/2 cup of custard each but I only have slightly more than 2 cups of custard and filled 5 ramekins. The Christmas busyness got me distracted when I made the creme brulee and I forgot about the jam at the bottom of the ramekins although I remembered it earlier in the day! So no jam surprise, just regular creme brulee for me. I sprinkled the one on the right with white sugar just to see the difference in effect and it doesn’t look as good as using brown sugar. The taste? Well, I could have under-baked it or maybe it’s meant to be this way but it was too soft for me. While the taste was good it felt like ice-cream that has been sitting out for too long. 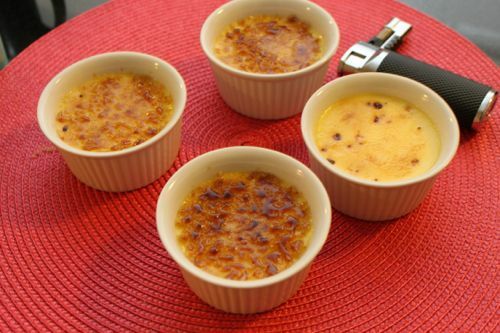 Take a look at other Creme Brulee here. I would like to end this post by wishing everyone a Merry Christmas, Happy Holidays and a Happy New Year! 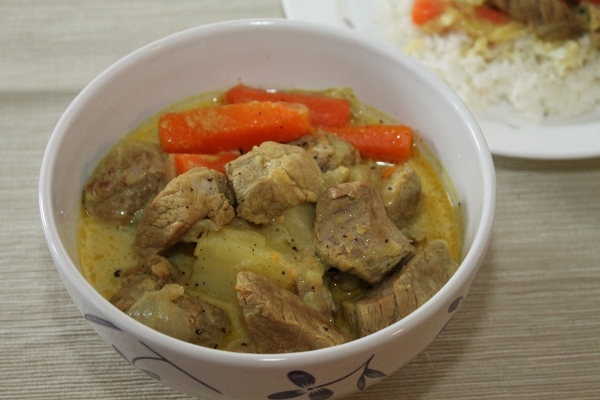 Another Asian-influenced dish from Around My French Table; pork curry-stew. 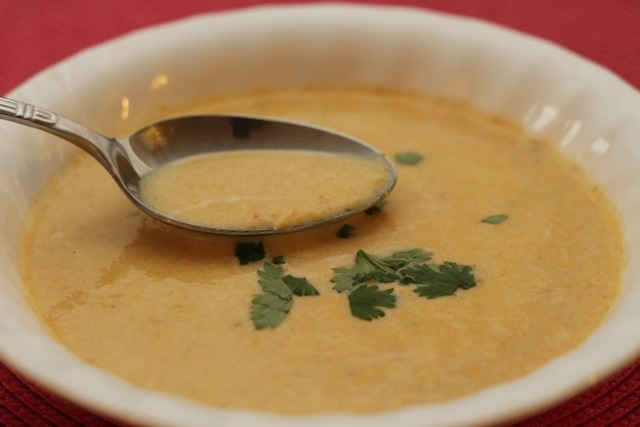 Turmeric, curry powder, cardomom seeds, coriander seeds, lemongrass and coconut milk are used in this curry. 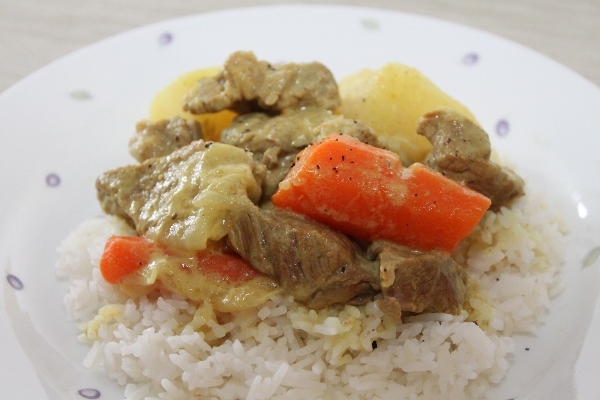 This recipe says to braise the stew in the oven but I cooked it the way I cook curry – entirely on the stove. It was too hot to have the oven on anyway! I cooked the potatoes and carrots separately as Dorie said but cooked the onions with the pork to add extra sweetness to the stew. I also poured all but 1/4 of the can of coconut milk into the Dutch oven and added the remaining milk only at the end as the flavour of the coconut milk will be cooked away when cooked too long. I omitted the honey too as I didn’t think the stew needs it, preferring it savoury than sweet. 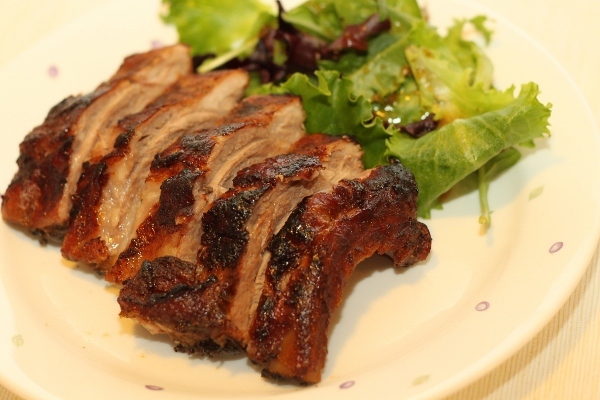 This week’s French Fridays with Dorie recipe is ribs marinated with Chinese 5-spice powder and ground ginger. Chinese 5-spice and ginger? I’m not so sure about that! They are both strong spices and I don’t like Chinese 5-spice powder very much. However, in the spirit of adventure, I went along. The ribs are first rubbed with the spice mixture and then marinated in a mixture of apricot jam, orange juice and lemon juice. The cola gets pour in at the last 45 minutes of roasting. My ribs were marinated overnight in the dry spice rub only as I didn’t have the jam and juice and could only get them the next day. Instead of apricot jam, I bought a bottle of orange jam with orange peel that was on sale. I like the slight bitterness that the orange peel imparts. The second change I made was to use back ribs instead of spareribs. Baking the ribs was easy but it was a hot day that Tuesday. It was 29C in the afternoon, humidex at 38C! Each time I open the oven door to baste the ribs I would wince! Finally, after almost 2 hours, the ribs were done. There were still a lot of liquid left in the pan. 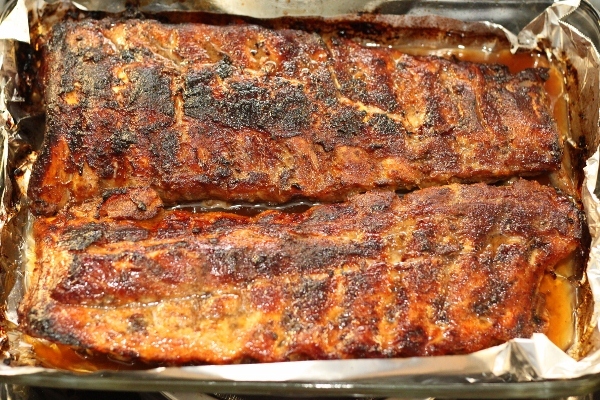 I wonder if it’s due to the pan being small – I used a Pyrex glass pan and the ribs were touching the sides and each other. I’m going to go read what the other FFWD members think about this recipe. Click here and join me. I skipped quite a number of weeks of French Fridays with Dorie (FFWD) beginning the week(s) before my vacation, during and after my vacation. I’ll catch up whenever I can on the recipes I missed like this one. However, this quiche was made mostly because I had to buy a packet of bacon for the bolognese sauce I made earlier and I wanted to use it up! After checking FFWD and AMFT for recipes with bacon, I separated the bacon according to the required number of slices for the recipes, wrapped them up and froze them. This quiche requires 4 slices of bacon, 10 ounces of spinach, just 2 eggs and 2/3 cup of heavy cream which I substituted with half-and-half. There’s also a sprinkling of Parmesan cheese on top. I didn’t have to make the tart shell from scratch as I had a Tenderflake frozen pie shell in the freezer. 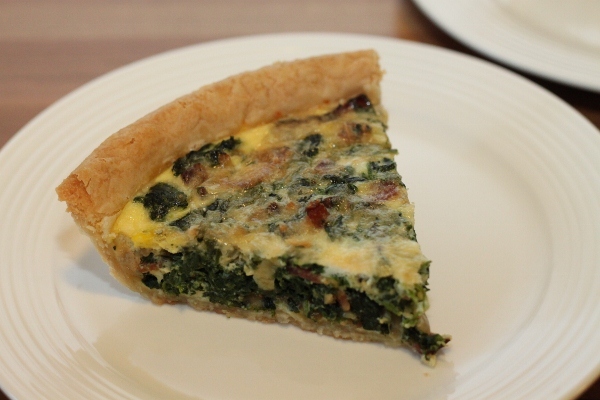 A simple quiche to put together although you do need time to prepare the spinach and cook the bacon till crisp. Big Kid doesn’t like quiche because he doesn’t like the soft custard but he liked this quiche. The proportion of solid ingredients is more than the custard in this quiche. I like it this way too. 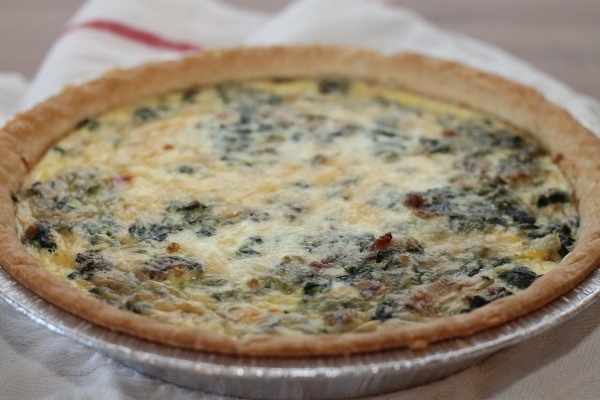 This quiche is also a good way to eat lots of spinach! Here you go, Popeye! I made this awhile ago but I had notes written in my Around my French Fridays cookbook. The broccoli was first steamed, seasoned and set aside. The crumb coating was then made in a skillet – butter, garlic, bread crumbs and lemon zest. I didn’t have any fresh mint or parsley to add on so I left it out. 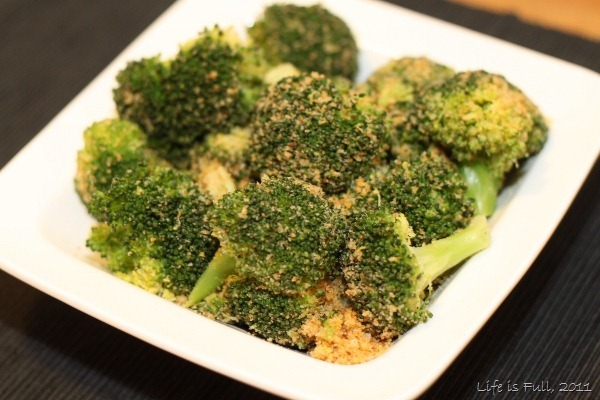 While the crumb coating is nice, I felt this was only a mediocre way of dressing up broccoli. It would have been nicer if the broccoli wasn’t cold. Tossing the broccoli with the crumbs in the skillet wasn’t enough to warm up the broccoli that had gone cold while sitting. The crumbs didn’t stick well to the broccoli too and most of it end up at the bottom of the plate. I also felt the dish was a little dry but that could be due to me not using the full 4 tablespoons of butter for the crumb coating! Check out how other FFWD members did with this dish, click here.